This entry was posted in In a Vase on Monday and tagged arranging flowers, blog hopping, creativity with flowers, flowering arranging, flowers in a vase, Hydrangea, in a vase on monday, Pink, The Importance of Being Earnest, The Sweet Life. Bookmark the permalink. Thank you, Susie. In the end I was happy with the results. 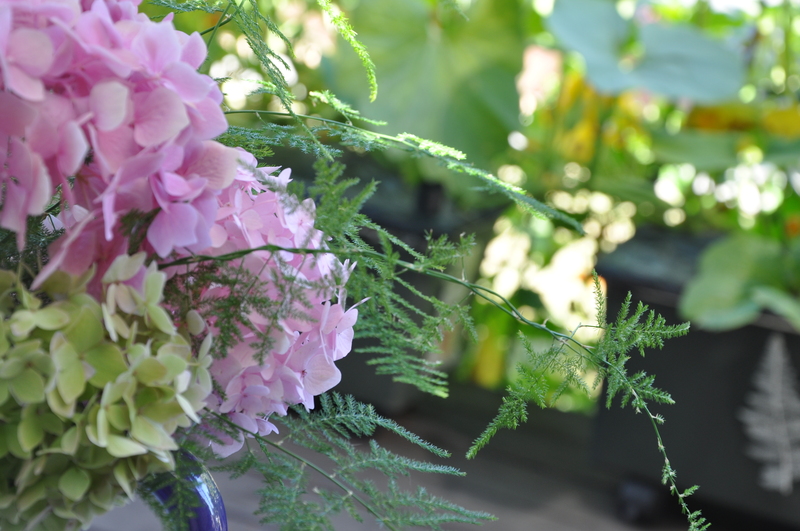 I noticed that at least three of us had hydrangeas in our vases this week. What fun this has been. (((Pauline))) You made me feel warm inside, too. Thank you. I struggled with that arrangement for a long time, and then just gave up. Sometimes you can’t see the forest for the trees. I finally realized I had beautiful flowers, some lush green ferns, and a pitcher that I love…and that was enough. I’m sorry to hear your hydrangea didn’t do well. I’ve learned over the years, that not everything does well in my garden. Things don’t get a lot of second chances. I planted a pretty flower called Stock many years ago after buying some cut flowers at the local farmer’s market. Within two nights, the snails had eaten them to the quick. I realized that, pretty as it was, it would never survive in my garden. The book is delightful. The artist’s drawings make me smile, and I would venture to guess you would enjoy them too. I hope the book is still in print, or that you might find a used copy. It’s a delight. The book is in the ‘currently unavailable’ list – so I shall just keep it on my shopping list and keep an eye open. I’ll be anxious to hear how the DE works out. Sorry to hear the book is unavailable. I hope a copy turns up somewhere. I turned part of my compost today, and out spilled wonderful, red worms. All that organic material makes me happy. 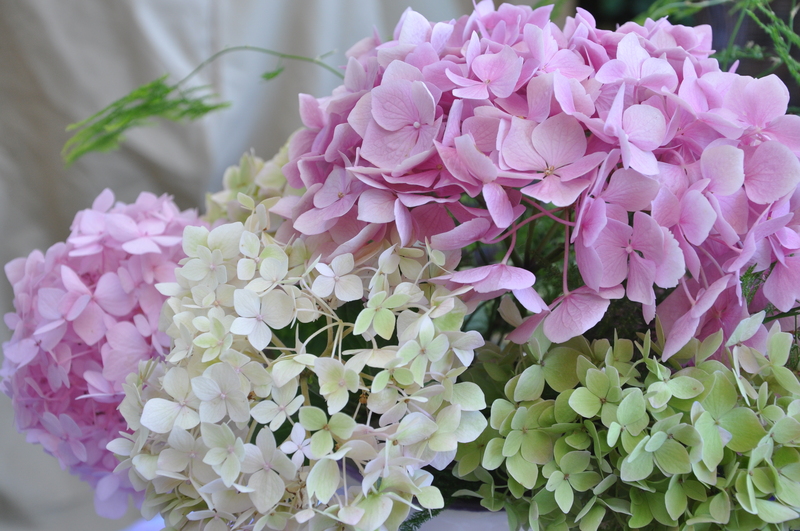 Lovely and I LOVE hydrangeas! Thank you, Cindy. They’re quite spectacular, I agree. Looks like it turned out great Alys 🙂 We have 2 giant Hydrangea’s 1 blue and 1 white and the blooms are going crazy this year. Thanks, Joe! Aren’t Hydrangeas incredible plants? I’m happy to hear yours are doing well this year. Thank you, Cathy! You are so right, it is addictive. I’m going to try for every other Monday. We’ll see how it goes. Thank you, Christina! I did make it over to your blog link last week, but didn’t make it back here to comment. Love your garden. Very Pretty ! I like how you MacGyver’d your way there too. I think found objects are more stylish really than a glass vase. It’s all perfect on your tie-dyed cloth. I accidentally tie-dyed an aqua tank top yesterday when it somehow got into a bleach filled white wash, but now it looks like clouds and goes nicely with a skirt I have with birds on it (bought in San Jose). I sure wish the Hydrangea grew better here. I think I told you before how pricey they are in arrangements, but so worth it. Asparagus Fern is also one of my favourite fillers too. The funeral home in Leduc where Adele and Kenny live don’t care for it because it sheds if not really fresh. I like the airiness of it. It’s just a little whisper of green but makes a difference. Do you just grow that in the garden too? I fell asleep on the sofa early last night, now on my way to bed xox nighty night sweetie! 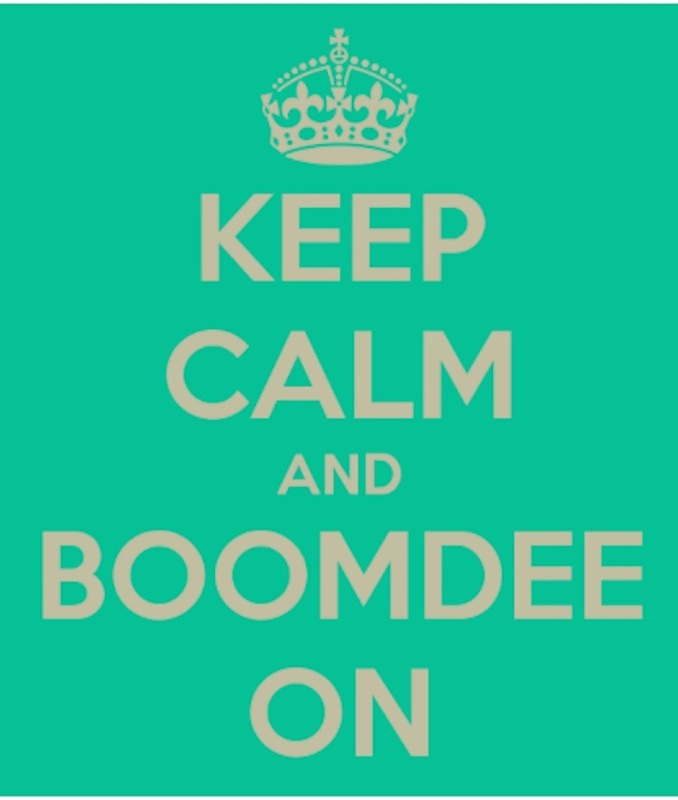 Thank you, Boomdee! I agree with you on the vase. It’s much more fun finding something interesting to put them in. A friend gave me a great idea for the art vase though: bulbs. The shape will work well. I wish you could grow hydrangeas, too. They’re just amazing flowers and pretty dried as well as fresh. I love all to color transformations, too. 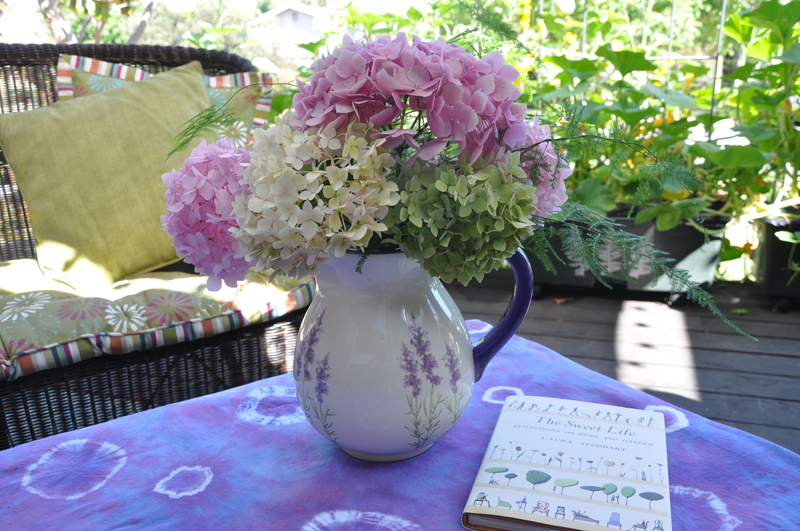 Yes, I am growing the fern in the garden, and thank you for the inspiration to write about it. On the subject of falling asleep, I had a migraine (neck related) most of yesterday afternoon. I slept early and well, but put in five hours on my feet at my clients today which knocked me out. I ended up napping, with my shoes still one!!!) for two hours. LOL, shoes on!! You must have really needed to close your eyes. I figure, catch the zzzz’s when you need them. Prescribed sleep times (i.e. 11 pm – 6 am) seem quite elusive to me right now. So I just sleep when I can and feel like it. It’s better than no sleep I guess. I did! Undoing buckles seemed like too much effort. I was *that* tired. I’m sorry to hear that sleep has been elusive. I’ve had a few odd days as well. I’ve been up since 4 this morning so imagine it will hit me soon. Awww…thanks for all those kudos. I wish you could stop by. That would be great fun. Marlene, I’m impressed that you’ve stuck with your blogging and commenting in the middle of all you have going on. I’m also happy and grateful, as I always enjoy your comments. I think you posted a photo of a white hydrangea in one of your moving posts, so hurray for you! You’ll have to celebrate one of your renovation milestones by bringing one of the blooms indoors. Ours are starting to fade now but still so pretty. It does sound like more than you were promised, actually, but good for you for going with it. We don’t miss our wall to wall carpet at all. So, so beautiful–what a touch you have with all things blushing and blossoming, Alys! And it’s funny, when I peered closer to the table with the book on it, I thought I recognized it, but then reading further down, realized that no, it wasn’t what I thought it was. And then I glanced at my bookshelf and saw the identical author–just a different title. Stoddart has also written a wonderful book called: All for Love. A Romantic Anthology. Quotes from some spectacularly clever folks. And now I shall hunt down another of her delightful reads. Cheers! Thank you! I enjoy gardening and arranging and count my lucky stars that I can do both. How cool that you too have a book of Stoddart art and quotes on your shelf. Kismet! I’ll add your title to my Goodreads list before I forget it. I love having a place to log books (those that I want to read, those that I will read and those and the rest that may have to wait till my retirement years.) I hope I can still see by then. That arrangement brings grace and beauty to your porch. Yet another talent … it’s the artist in you, Alys. The photos are lovely, too! Awwwww…thanks so much, Laurie. It’s been eight days now and the vase is still there. The greens are as fresh as the day I cut them, but the blooms are fading. They’ve shrunk and dried and now create a different beauty. Your color combination is very pretty! 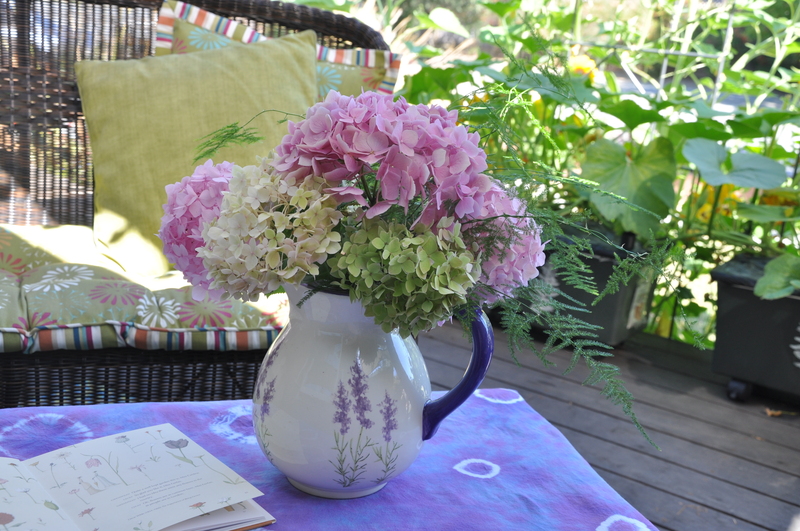 I miss Hydrangeas – I need to find a place for them in my current garden. Thanks for visiting my blog! Thank you, Kris for your kind words and for stopping by. Much appreciated.